As the early mornings are started to get cooler it had me thinking of going into town to buy a new dressing gown. Mollie the Collie, ripped both mine last year when she was a pup by jumping up me first thing in a morning so I need to invest in a new one. I was moving somethings around in the garage when I found my sons Onesie that he did not want anymore. I looked at it for a while, thinking of what to do with it? Cut it up to make a teddy for my daughter? Make a blanket for Mollie? No, nothing exciting sprang to mind so I chucked it on the charity or tip pile and left it. The next morning I was having my extra five minutes snooze as I did not want to get got of bed early as it felt a little chilly. I diffed off into a little sleep Zzz.. 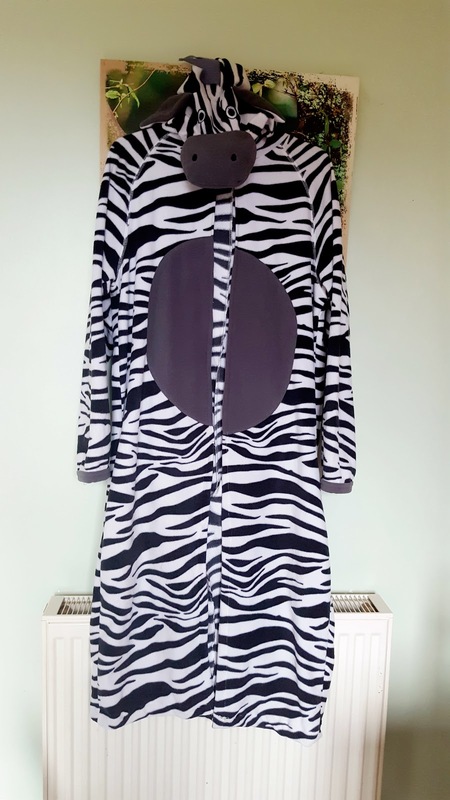 I started dreaming I was up-cycling my son’s Onesie into a dressing gown to keep me warm!! I woke up in a hurry and thought, what a great idea! It would also save me money having to buy a dressing gown. Bonus!! My son brought his Onsie for Uni but only ended up wearing it once or twice.He was not ever a big fan of them like me and his brothers and sister were. Getting set on my brilliant idea. What could go wrong it is only something no one wanted!? First up I cut across the legs where I wanted the dressing gown to finish. 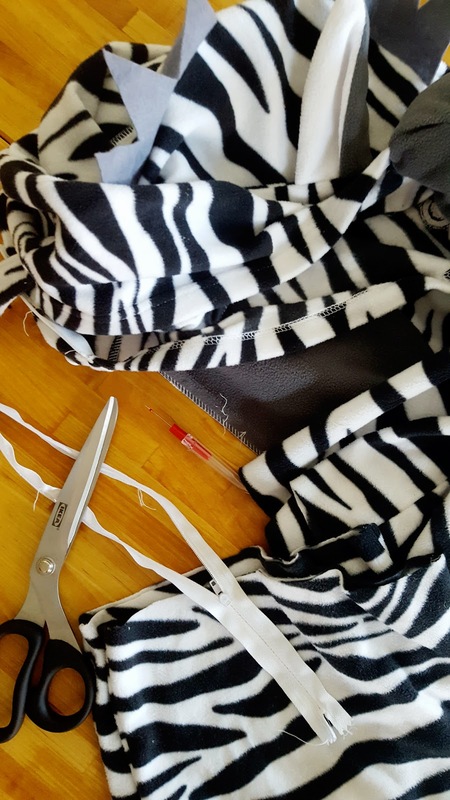 Next up, unpicking the stitches around the legs, the bum bit, then the front bit between the legs and I took the zip out. Next up I popped the front bits of material together to cut a straight line where the extra material would have been for the legs and same on the back. To make it all in line. Then I sewn everything by zig zag stitch to make it look professional. I sewn the back of the dressing gown together, made a hem around the bottom and sewn the fold down up the front to finish it off nicely. It still has it head and tail on to so it looks great. Guess this what I am doing this week? "Fish Finger Pie Recipe: Seafood Week"
This is such a fab idea. And it looks great! Claire! THIS IS SO INSPIRED – I love it! The finish is great too. I have so many onesies that I think I might have to give this a go myself too! Love it. 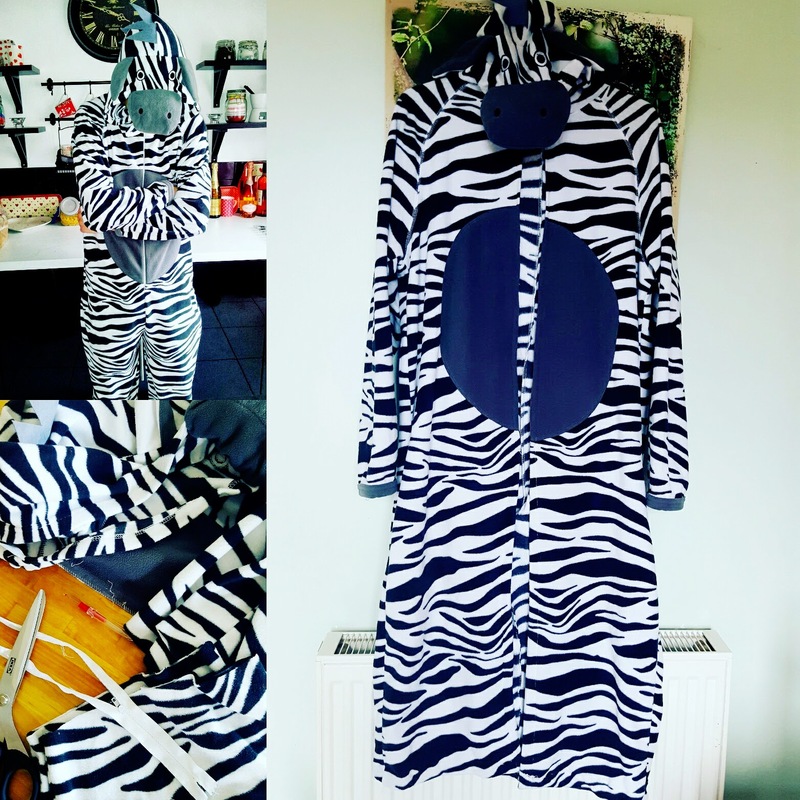 What a smart way to upcycle the onesie! It's super cute too! So cute! Some of the best ideas come to me in my sleep. Now if only I could remember them. Brilliant, it's still a zebra though 🙂 But at least it saved a trip into town! This is brilliant. 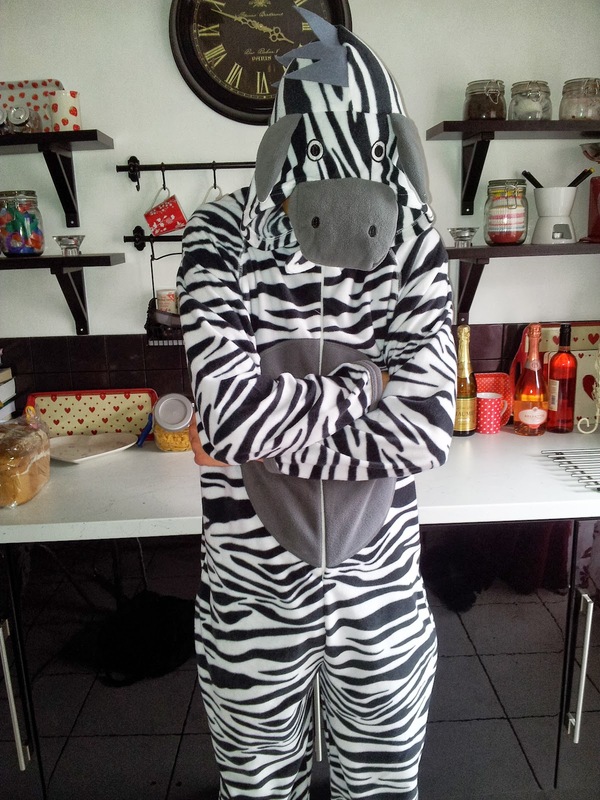 I never really got on with onsies I found them too warm too and I dont want to have strip to use the bathroom. Same here Laura, I like the idea of them but they are too warm for me too. That's funny that your daughter is already requesting her own, I don't blame her!